As every professional concrete contractor knows, having the right tools is as important as knowing what to do. Hand tools and equipment that give years of reliable service spell the difference between jobs that are completed successfully, on time and within budget, and problematic situations that lead to wasted time, strained business relations and decreased earnings. Even though the best professionals may “make it look easy,” there is little in any construction trade that is left to chance. Experience and knowledge have led to the development of proper tools for each aspect of the work. Those who take pride in their work want to use the best tools in the business. Specialty concrete contractors employ a variety of hand tools to make quick work of any job, whether the project is a patio, a curb, a driveway or a complete building slab. Of course, some jobs require a wide variety of small tools, in addition to the finishing equipment. The end goal is always a smooth, level slab, or a functional, strong installation, whatever its purpose. Although it might be possible to form rebar through brute strength, any contractor will want to have a portable bender and cutter available on the job. Combination units are available in totally manual configurations with long handles for effective leverage as well as in electric/hydraulic versions designed for transportable hand-held heavy-duty use. For those who prefer single purpose tools, there is also a line of benders and cutters designed to meet your specific needs. Set foot on any construction site, from a bridge or freeway building project to a backyard patio installation, and chances are you will find the construction crew with at least one manual bolt-cutter. Even the serious DIYer will undoubtedly have one. 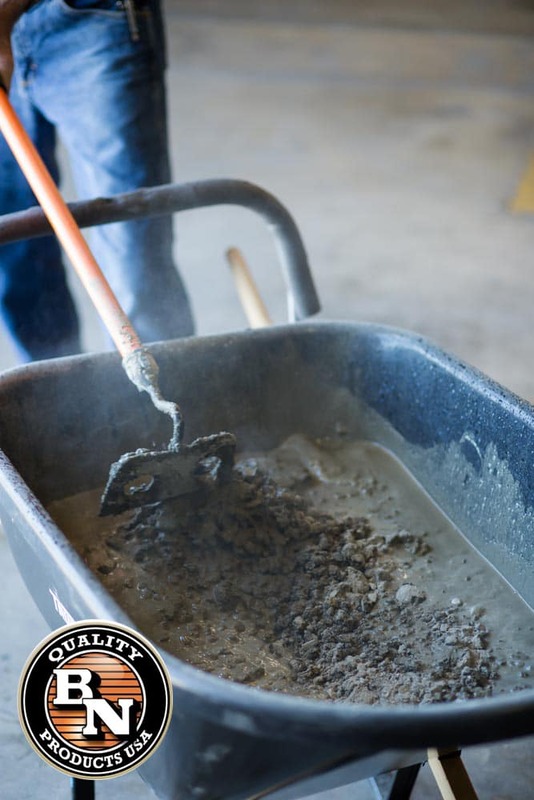 The standard piece of equipment for mixing small batches of cement or grout is a paddle mixer. The BNR6400 is an 1800-watt two-speed design built to handle tough jobs. It features variable speeds and can also be used to gently mix paints and to accomplish a wide range of household tasks. Smaller contractors or homeowners who envision completing multiple jobs might also be interested in the BNHH-50 Hydro-Hoe to enable efficient mixing of wheelbarrow size batches of cement. The BNCE-20 Portable Saw is a hardworking addition to the line of tools that discerning professionals won’t want to do without. With a rotating trigger handle designed to allow a wide range of cutting angles and access to tight spots, this is the cutter that will perform on-site tasks from cutting rebar to slicing off protruding all-thread to trimming conduit, tubing or pipe material. Its maneuverability and compact size make it easy to use and easy to transport, and its ability to cut close to any surface make it a desired addition to your job toolbox. Although perhaps not as commonly used by concrete contractors as by other trades, there are occasions when use of a power nailer is warranted. Certainly, for jobs less extensive than a complete slab, an electric nailer can offer a distinct advantage. For a smaller project such as a countertop, a barbecue enclosure or a brick mailbox foundation, it would be desirable. Again, your choices range all the way from a palm nailer to a heavy-duty concrete nailer. Visit a construction site while a professional concrete contractor measures and forms perimeters, lays out rebar or rolls steel mesh; or witness a “Pour Day” as the cement mixers are lined up in a holding pattern waiting for their turn. Then stay to watch as the concrete finishing is completed. It is like watching behind the scenes at a well-rehearsed stage production. Every person on the scene has a part and plays that role perfectly. The tools also are perfectly suited for their functions, and the job becomes streamlined and efficient.